I'm bringing you some of my adventures from late autumn and in fashion and beyond there was a lot to cover and discover ahead of a long Christmas break with the family away in the country. British Fashion life is something diverse to be celebrated and we are truly fortunate in the UK for what we have. As many of you will know I'm a staunch supporter of the British Haute Couture industry, it may not have the global spot-light of Paris at the moment but it has a celebrated tradition. 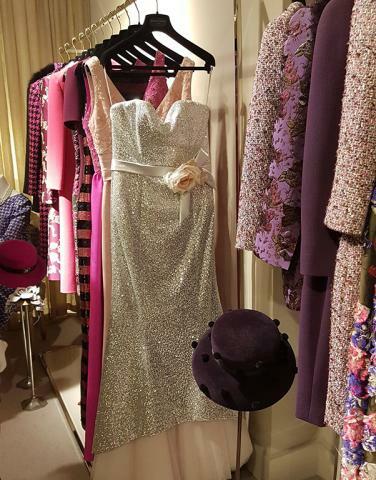 So what better way to head towards the party season than with a look at some beautiful British Haute Couture. 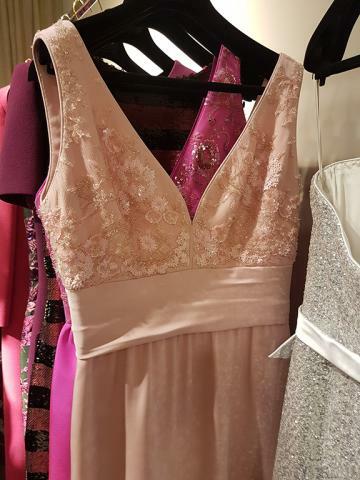 styles appropriate for serious formal-wear occasions and many examples of their work can be seen at weddings, the races and formal public and private events including those lead by Her Majesty the Queen and other members of the Royal family. Although Stewart's clothes hit the mark when dressing the monarch who is one of the most experienced Haute Couture clients he may come across. He ably dresses a diverse client base including a large number of brides from across the UK and also internationally creating moments that will last a lifetime. Looking at his varied collection of evening gowns, day suits and coats it's easy to see why he is a trusted hand for formal wear. Note the colour, lots of bright shades showing confidence and also providing visibility for high profile wearers. 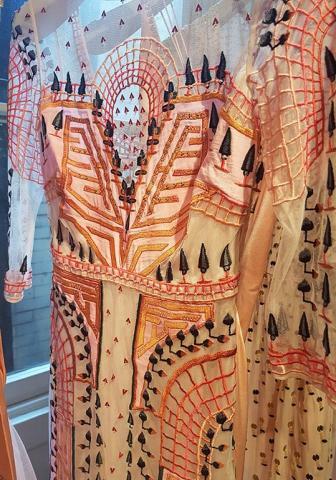 All dresses are designed and produced in his central London atelier where he can keep an eye on production. These are pieces that will ensure a client will always look the part and be confident and prepared for the day or evening that lies ahead. There is an unmistakable sense of fun elegantly illustrated in the outfits. 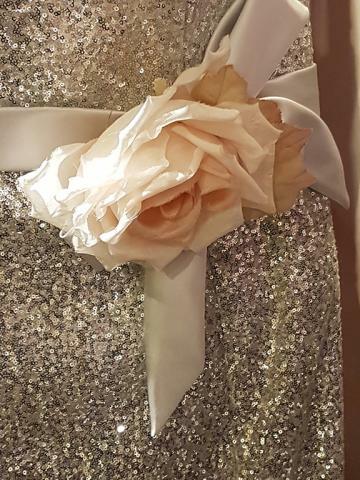 Above to the left amongst a myriad of bright colours a silver sequined dress accented with an apricot blush rose sash tie above the waist carries plenty of sparkle but is still restrained enough to be demure. 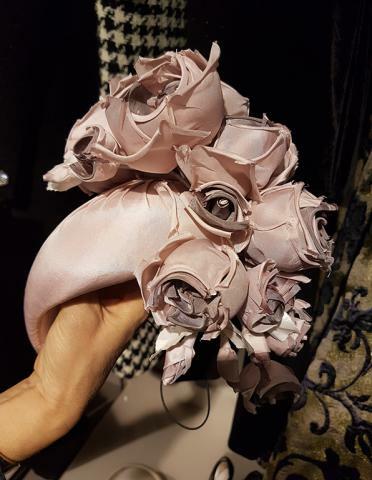 The rose fabric also appears in the under layer of the dress ensuring the composition includes only three different colours overall. You could whirl around any ballroom in this and wear it to a special dinner out in town or at a friends home. 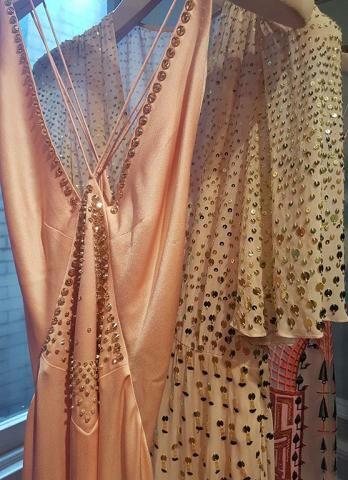 Behind it on the rails you can see a joyous series of colours that appear in the collection and above to the right the bodice of a beautiful soft apricot gown with it's light embroidery and simple band show the charm of an evening dress with a relatively simple composition. The embroidery is a joy to behold. 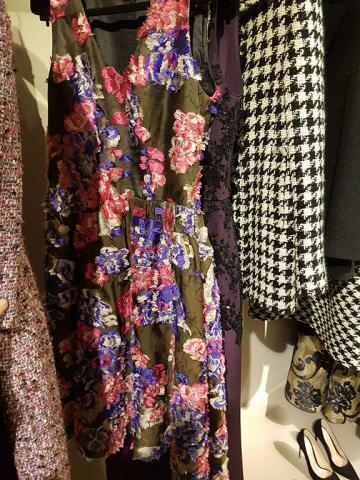 To the right a black dress with magenta floral embroidery favours a simple tunic style that has been popular since the mid to late 20th century and still forms the basis of looks in many professional and formal wear wardrobes. Worn alone or with a wrap and jacket it's a piece of beauty. 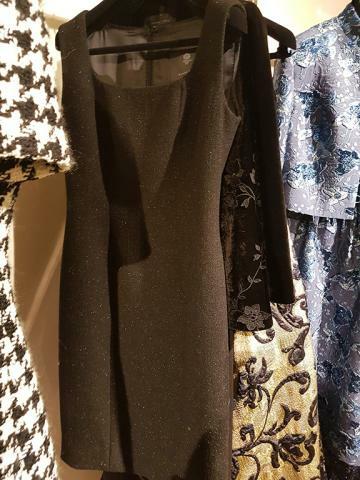 A simple black sleeveless dress, in that essential style we can all use for work and leisure, sits on the rails along side it's brightly coloured counterparts. 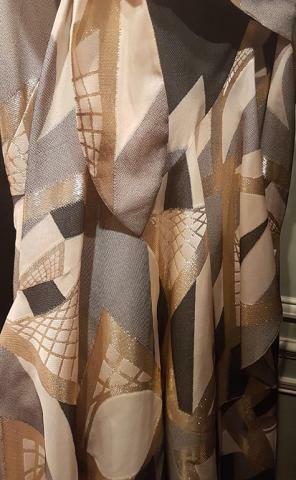 This is an adorable classic that would look stunning worn alone with black heels and a purse or matched with a highly patterned or plain jacket. 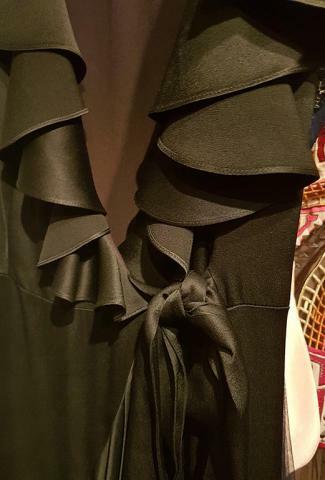 It's also flattering to many different figures and can be cut to suit as you would expect from a master couturier. 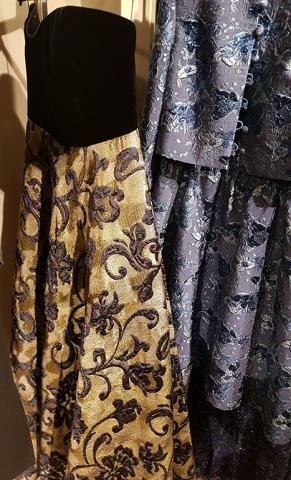 Behind it on the rails a beautiful golden fabric stretches across the body of the skirt of a dress accented with beautiful scrolling black flowers. If the artistry doesn't take your breath away in itself, the subtle combination with the black velvet bodice will surely steal hearts and when Rachel Trevor Morgan held this up in front of the mirror looking back at herself, a little cheer could be heard in the boutique as she looked absolutely wonderful. It's a dream timeless ball gown. 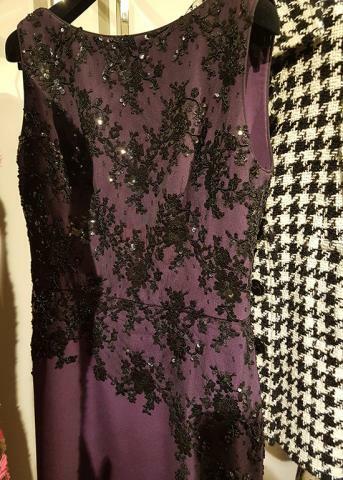 Sleeveless dresses are a powerful part of the range that Stewart has to offer clients and above in purple a shift dress embroidered just a hint of sparkle carries a discreet amount of magic, just right for a formal event. 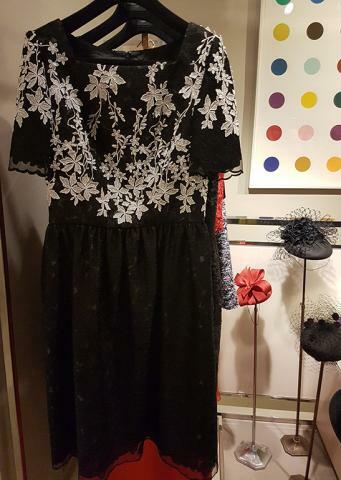 You could wear this dress anywhere though and enjoy lunches with friends as well as dressing it with hat, shoes and coat for formal settings. 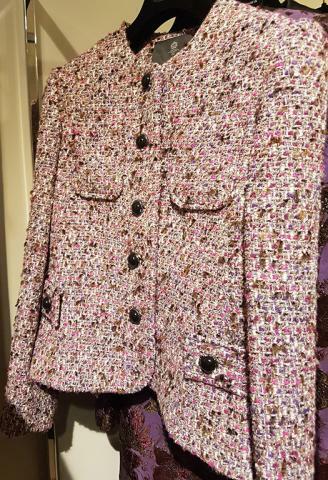 The beautiful woven tweed coat to the right features charming boucle fabric that ensures both warmth and style. With an eye for practicality the breast and hip pockets sit as beautiful yet practical points of note in the garment. 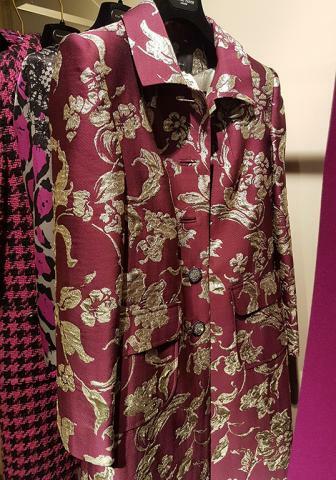 Floral detail across the coats above in magenta and lilac are a definition of stylish luxury with the utmost care taken to create pieces to cherish that, and I hope I don't labour the point, 'do a good job' for the wearer who invests in them as part of their wardrobe. 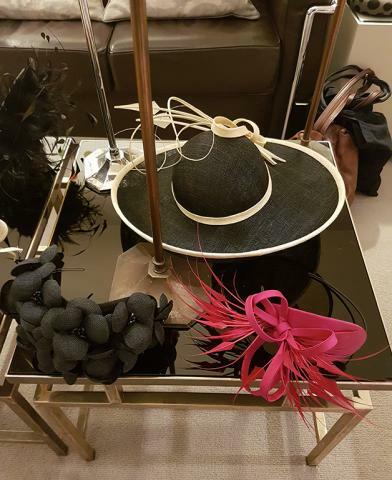 Haute Couture isn't inexpensive by any means but made to measure and with good care, these pieces can have a very long life in the wardrobes of clients. 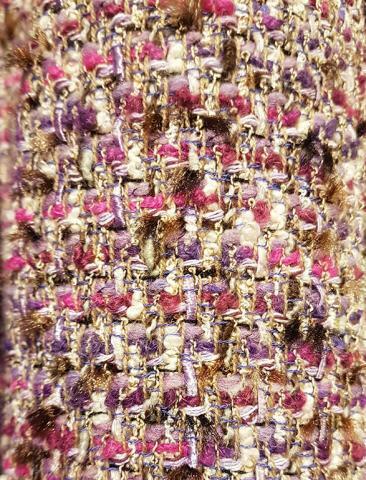 To the right above my photographers eye couldn't resist a macro shot of detail from the sleeves of the jacket above to she the woven tweed. 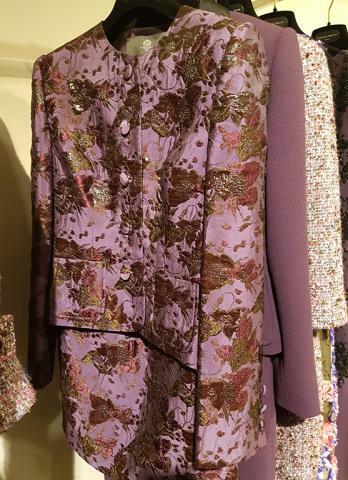 In a rainbow of pink through to lilac broken by white and flecked with bronze and gold for a contrast, it forms a very fitting starting point to base a complete look around. 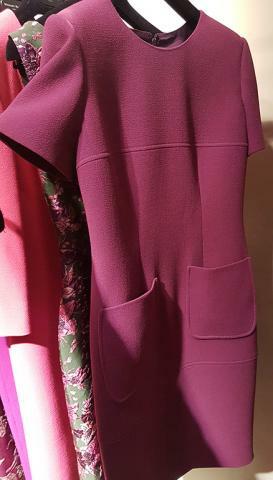 To the right a short sleeved plum coloured dress embraces rich colour in a simple statement of beauty with chic front pockets reminiscent of 1960's women's dresses. Hand-sewn flowers in a bright and beautiful contrast of pink and blue look perfectly in tune with the colour personalty of the collection. 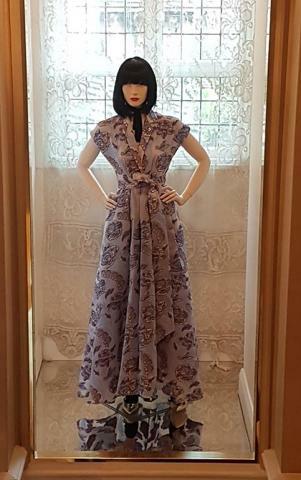 Again, like it's violet neighbour, this dress is sleeveless and with a simple delineation between the bodice and the skirt it forms an easy to wear piece. With sleeves added, this comfortable style can also been seen above in the black dress with white flowers embroidered onto the bodice surface and noted floral detail in the length of the skirt. To the right a close-up view of two of Rachel's hats that beautifully decorated the studio. It was a perfect moment to start assembling the dream outfit that you would have in mind. 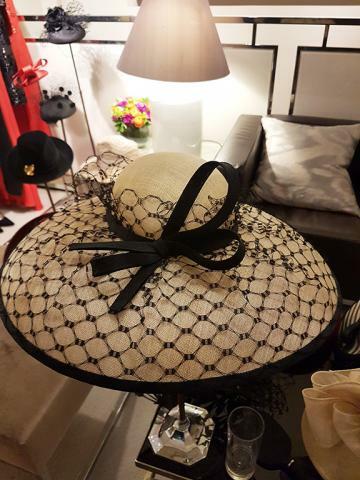 A broad brim is accented with netting and tied with a ribbon bow. With the netting gathered around the crown of the hat a touch of nonchalance enters the mood of the piece. To the right a lighter note is struck with soft pink and white flowers tied at the crown and a broad brim slightly concave in it's shape for the wearer. Every style, every shape you could wish for, or would want to try, Rachel can create for you. Based in St James in London at the heart of centuries old hat making studios she is proudly carrying on one of the most British of traditions creating both recognisably formal and fresh looks for clients. Probably my favourite millinery design was above to the left. A simple bonnet with a gathering of frosty Roses about the crown. There are lots of options as to how this could be worn and also for the time of year. 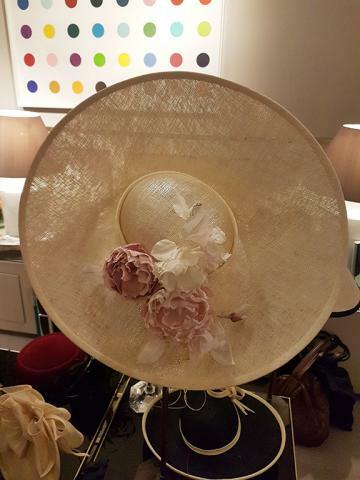 It would make a wonderfully fun hat to wear at the races or a summer wedding. 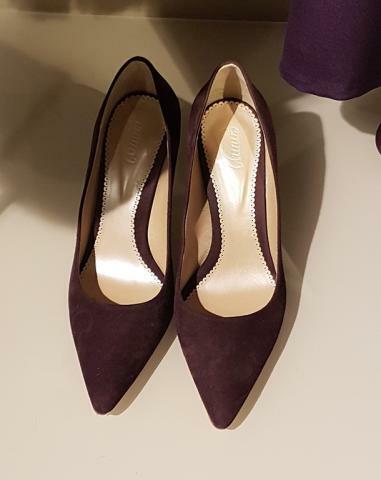 Much to the delight of many, London based bespoke shoe designer Emmy of London was also on hand to show how their shoes and purses could potentially offer the perfect finish to an outfit. 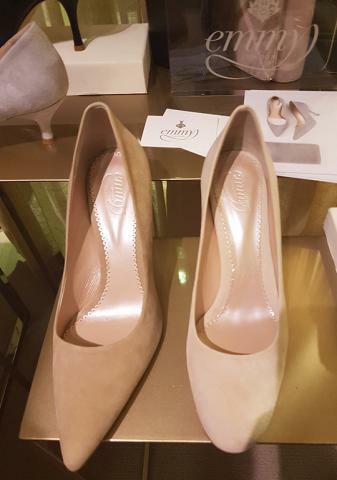 In subtle tones of nudes plus black there were many shapes and styles to suit different tastes and foot shapes. 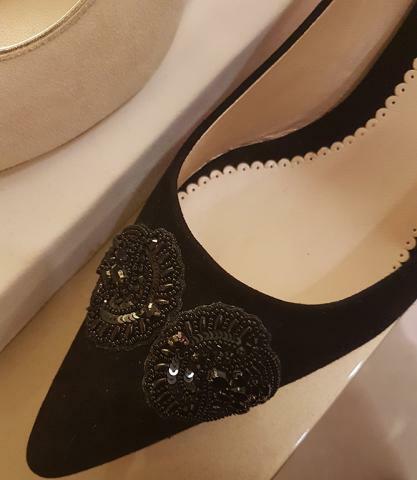 All styles and shoes are crafted by hand, as shoes used to be made for everyone and this allows particular attention to be paid to the needs of each client. As a person with broad feet I often wish that the traditional show market and skill base hadn't melted away as I think many people could benefit from made to measure shoes. The fabrics used run through a subtle range from suede to tan leather some styles are embellished with applique or can be at request. 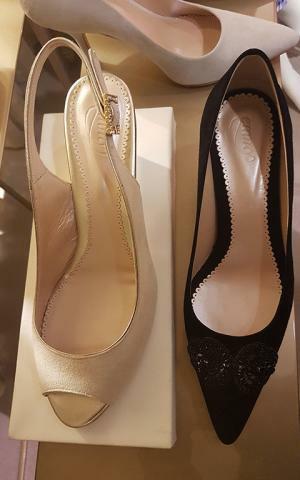 There is something irresistible about the effortless feel that Emmy's shoes have and you feel that investing in a couple of classic well crafted pairs to have in the wardrobe could be a very good decision. She's certainly got my vote and the combination with the styles of Stewart and Rachel is absolutely perfect. 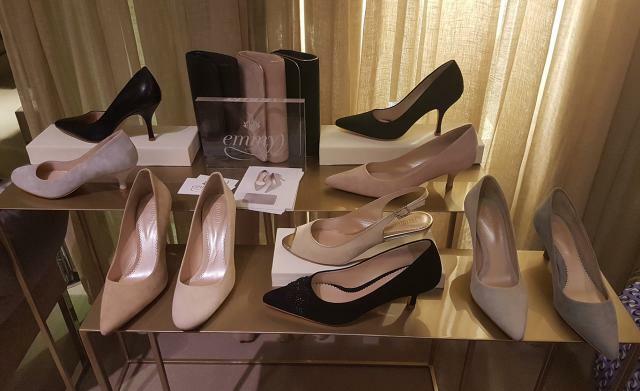 Now with a new boutique of their own on the upper Fulham road Emmy is a practical place on the map if you're in West London and looking for special smart shoes. work across several collections in the same place at the same time. Themed for Christmas with light dusting's of snow everyone was too busy chatting to think about any cold outside. 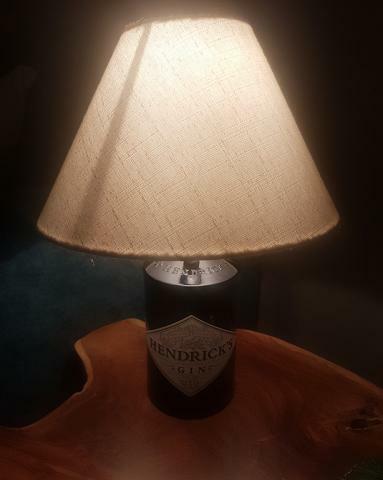 An empty Handricks Gin bottle transformed into a lampshade stand was a homely touch nodding to home in Scotland for Tessa and many of her friends there that night. A light of familial warmth at the party. Both soft drinks and stronger were on hand from the very kind team looking after us and all was delicious. Above to the left you can see the lapis blue of a stone faceted ring set in silver. This celebrates the bold colour and geometric influences of Tessa's Mexican Heritage which is close to her heart and informs many of her sensibilities. 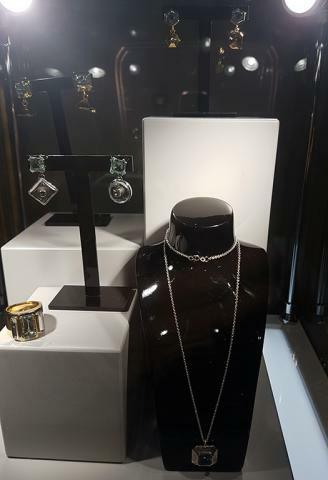 It's a charming piece of occasion or day wear jewellery that could be worn almost any time. 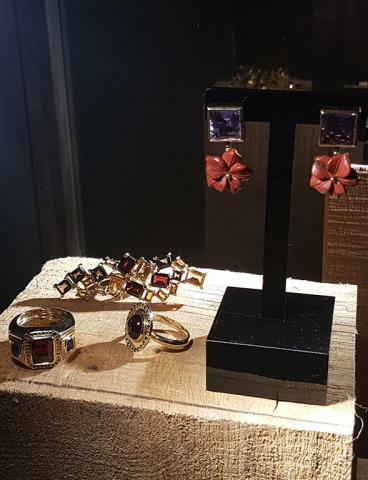 To it's right a set of cuff links each set with a large central stone provides a subtle addition to a look. 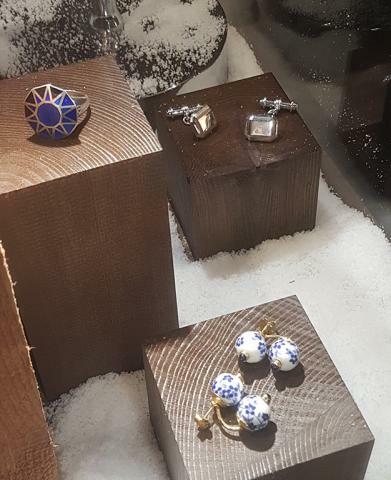 Below, taking inspiration from blue and white china porcelain two earrings in a matching pair form a tantalising hybrid of china-wear and personal jewellery. 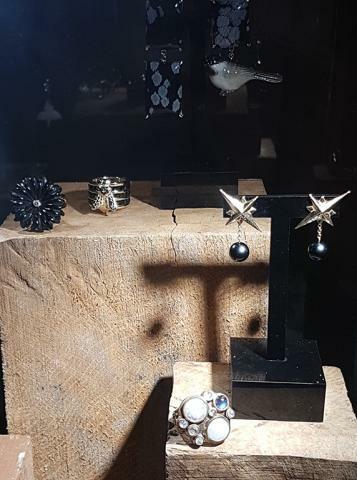 Centre above three pairs of individually designed earrings set with stones form both matched and odd couples allowing you to choose a harmony or a style contrast in your design. In the foreground a ring set with Aquamarine stones is a beautiful subtle statement piece that could be worn at work or at play. It's easily adaptable to compliment many looks. A pendant necklace carries a single square stone at it's heart creating a simple statement. This, like many of Tessa's pieces would make great gift jewellery for birthday or exam pass for example and also a nice treat for the self. 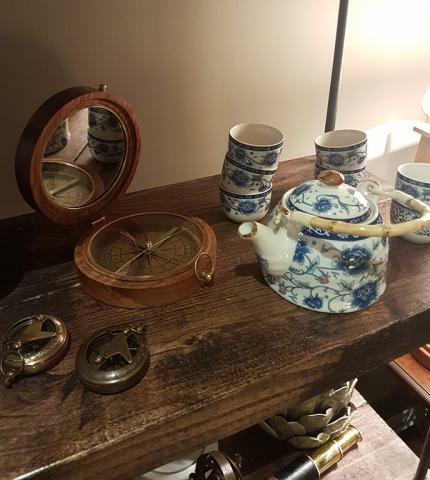 Pieces from several of Tessa's collections to date were displayed including the Mexicana, No Smoke Without Flowers, Penny Sweets and For King and Country collections. 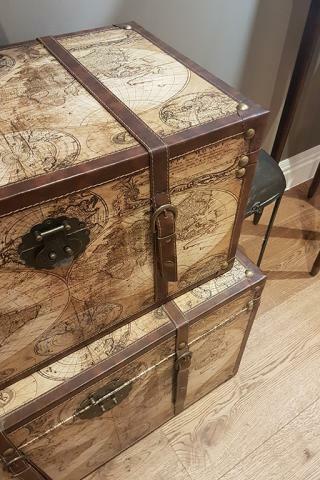 Each piece is stand alone and unique. 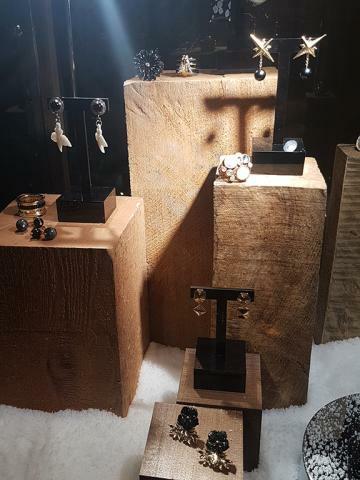 Stones and Amber's are carved by hand feature pieces are created as one of a kind items and newer to Tessa's offering are a range of earrings showing different element features to each of the two pieces. Above to the right you can see in closer detail a carved jewel on one side and a pig at the other, both underneath green leaves symbolising fresh life. There is meaning open to the beholders interpretation but the pieces are primarily fun also and created to raise a smile. 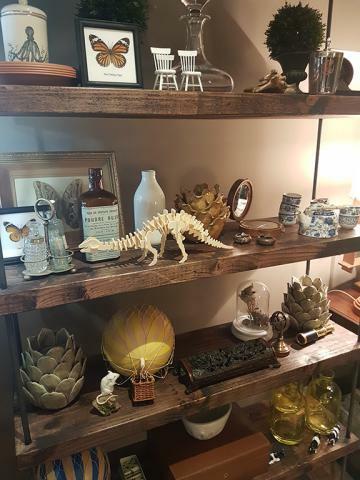 Centre left above part of the decour of Tessa's shop that shows how she has brought some of her collected curiosities into the store. Finds from travel, ceramics and even taxidermy illustrate her fascinations with natural forms and objects d'art. Illustrations and visual are key pieces of the story of inspiration for Tessa and central to her work is the formation of rich and detailed scrap books around the ideas and themes that she chooses to explore. These are a continuation of her childhood design projects and assembling these mood boards and scrap books are a mark of her signature originality. 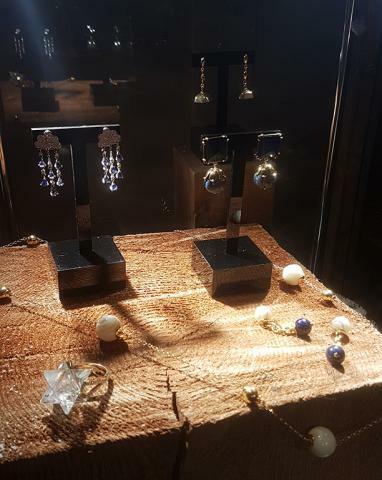 After a career in the art world following graduation from University, Tessa felt the yearn to return to a something that both fired her imagination, precious stones and design, whilst also re-connecting with a part of her childhood self. Digressing slightly, I also personally believe that we don't always completely change as we grow up and that a deep talent or natural vocation can be found within us in childhood that endures throughout our lives. 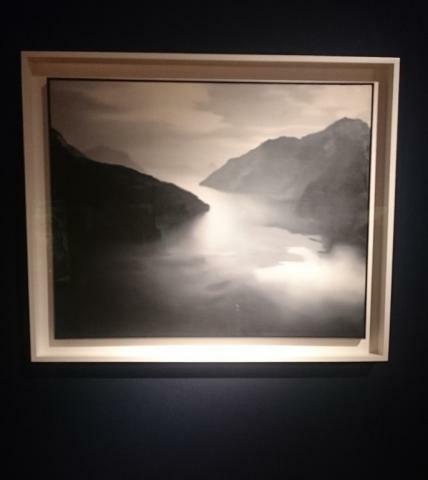 There are strong nature elements in the collections and a passion for the natural world is evident in many ways across her work. 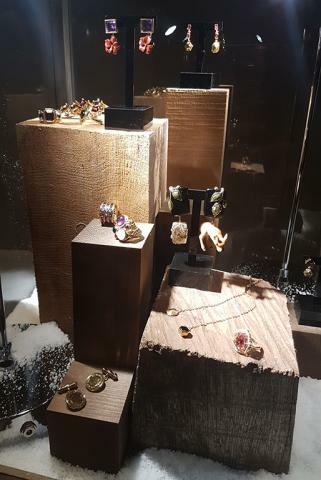 In my recent piece for Town and Country in the UK looking at the exciting emerging British based jewellery designers around at present, I used an image similar to the graphic on the trunk to the right from Tessa's show room illustrating the mood of travel brought to her work. Above to the left a globe in carved stone sits at the centre of a pendant formed to include the frame of a replica of the world. A small memento of travels or plans for the future perhaps. Two charming Mother of Pearl rainclouds appear on cuff-links and make a subtle addition to a work or social outfit for a gentleman. The joy of working with natural stones and elements is what really comes across. 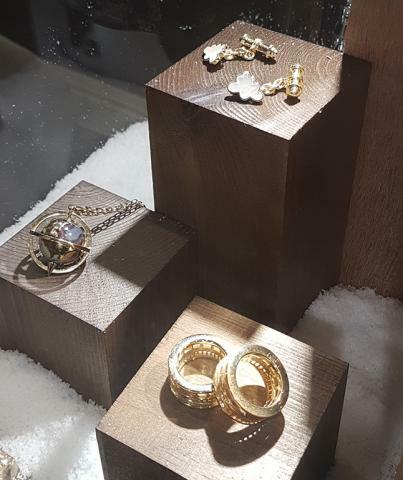 A white crystal is cut like a star to emphasise glitter and shine, rain drops from a cloud are created by setting tiny blue stones and move gently with the wearer. There is such a personal feel of art about Tessa's pieces that they capture you. 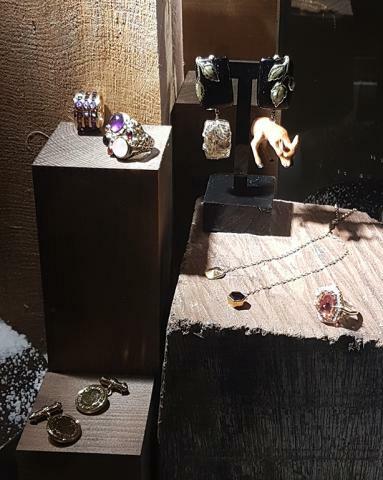 Her understanding and instinct for making conceptual ideas into wearable reality make her a perfect choice for creating bespoke pieces just as she ably produces her original designs. 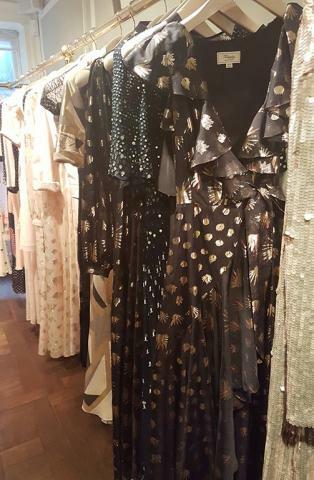 Nestled in a quiet location in a former townhouse in Bruton Street in Mayfair, Alice Temperley's London flagship is based at the traditional heart of residential Mayfair between Berkeley Square and the elegant arcades and shops of New and Old Bond Street. 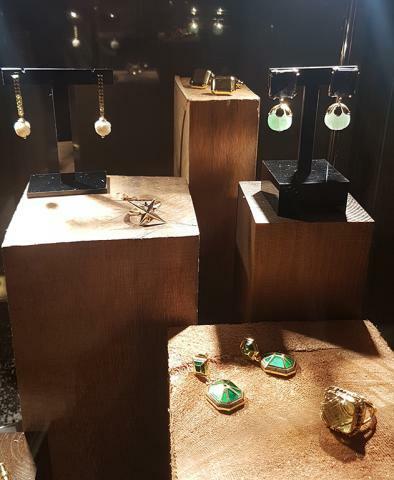 Today Bruton Street is firmly on the map for clients and admirers of high fashion to discover new pieces to add to their collections. A large ground-floor salon highlights clothes from current and new season collections and as you turn to ascend the stairs beautifully painted walls with birds in flight take you upwards past a mannequin wearing a look of the season. 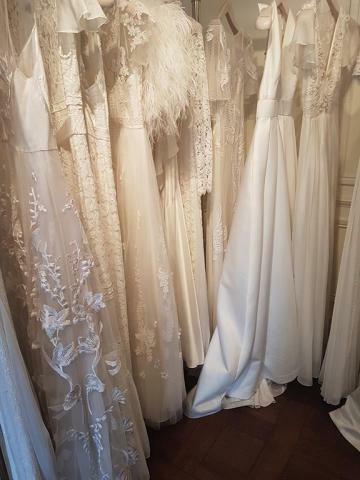 Upstairs are slightly more secluded rooms that you can arrange to have fittings in and also the famous Temperley Bridal area, more of this later. Beni and the team from Alice's studio happily talked us through the collection and the inspirations for the next season. 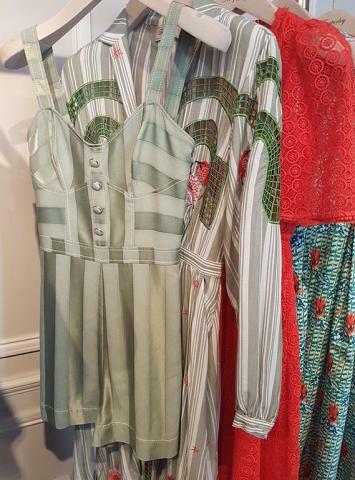 Light and bright were key trends in the first part of the collection that I saw with recognisable Temperley patterns and embroidery styles in long and knee length dresses. Aqua greens and blues and soft warm peach and pink colours set a relaxed tone for a day or evening. 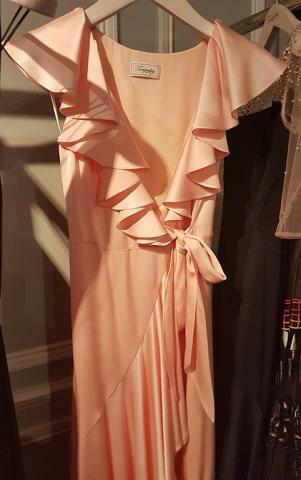 Single colour garments with charming details such as the halter neck silk top shown in reverse here look beautiful tied with a ribbon bow. As a longer blouse the very adventurous could wear it with stockings and heels but it could also be matched with a simple skirt or trousers and jeans. Luxuriant fabric is something that Alice tries to give some degree of focus to in the outfits that she composes and she often uses folds, sashes and draping to draw attention to the fabric as much as the overall style of a piece. 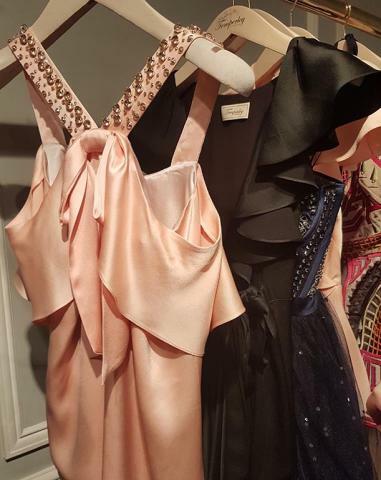 Soft folds around the neckline of the black dress echo the necklines of 1920's and 1930's dresses with the loose sash tie showing the simple wrap structure. 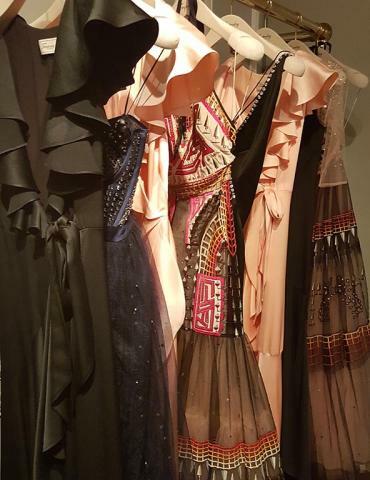 To the right a sweep of dresses working black, apricot and midnight blue also feature showing plenty of options for both a bold or understated look. It's a dressing up box with a Great Gatsby feel but if bold ostentation isn't your thing Alice has plenty of subtle style options up her sleeve. Beyond evening-wear there are plenty of looks for the daytime hours in hot climbs. 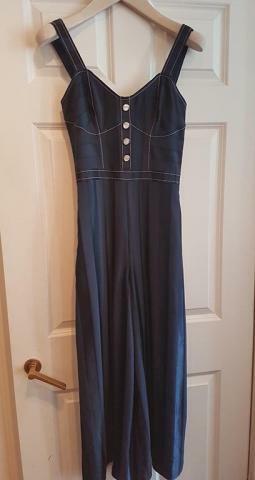 A navy denim dress with subtle panel detail in the fabric makes a soft tonal contrast across the surface of the piece. It's repeated in the pistachio mini dress of long top that you see next to the right. Here the tonal contrast is more pronounced but this is still an understated piece that you could wear in many ways. 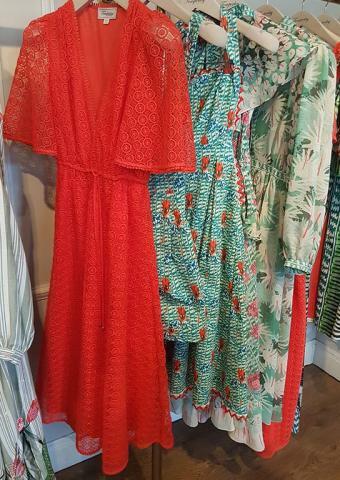 Behind it the diverse exploration that unfolds with colour in green and red offers many different dresses both in vibrant patterns and in red crochet sewn style. 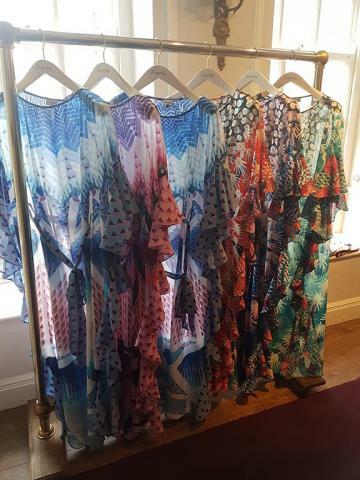 There is a hint of tropical and a hint of island paradise about them but these are clothes you can easily wear around your local town or village in the summer when out enjoying yourself or seeing friends. 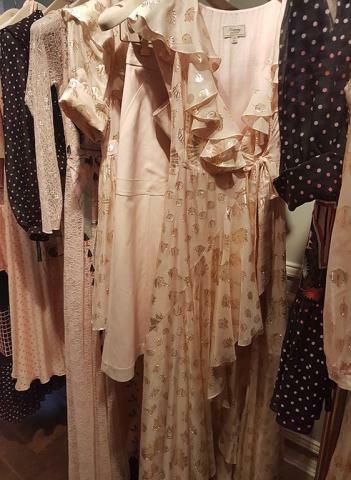 The Art Deco nuances of the Gatsby era also feature in a number of key looks in the vast collection and above to the left you can see enhanced detail of one such garment. 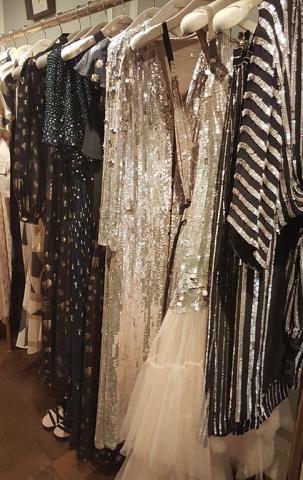 There is shimmer and sparkle aplenty in the above series and as with all Temperley pieces there is an innate ease to wearing them. Necklines tend on the whole to be plunging but there are many ways that more curvy figures could be supported. 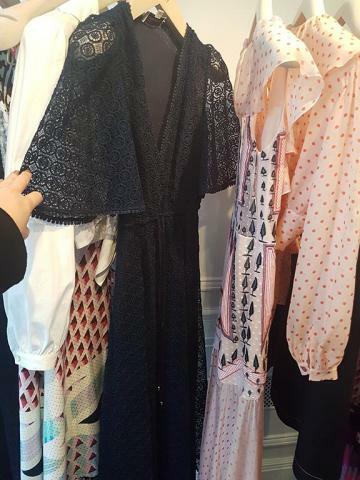 Even looser in style are the flowing kaftan pieces that are part of the Summer area of the collections. These are joyous things to see in the cold grey days of winter and if you should ever need any encouragement to make travel plans then these should surely be helpful. 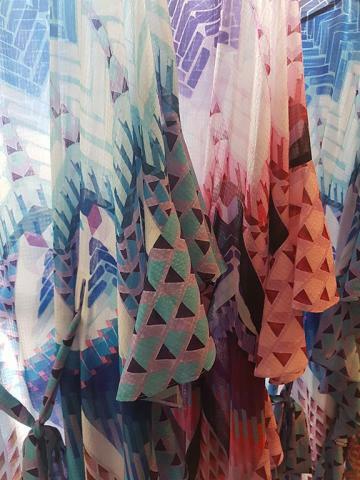 Carefully crafted, the light fabrics show colour playing through them in a captivating way. 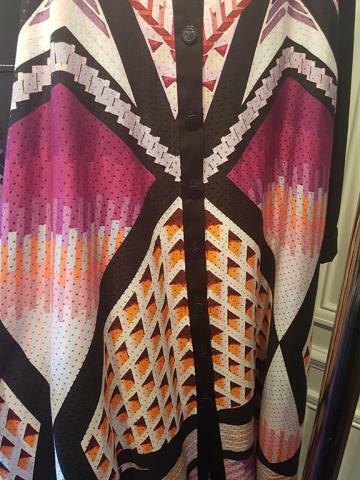 Easy to pack in the suitcase or enjoy wearing to brighten up winter and early spring days. 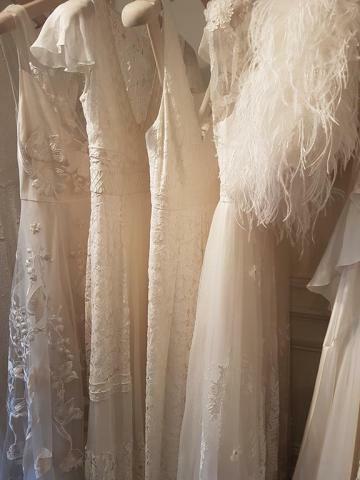 Temperley bridal is one of the most famous British bridal fashion Houses in the world and upstairs in the front presentation rooms of the third floor a plethora of dresses are on display. 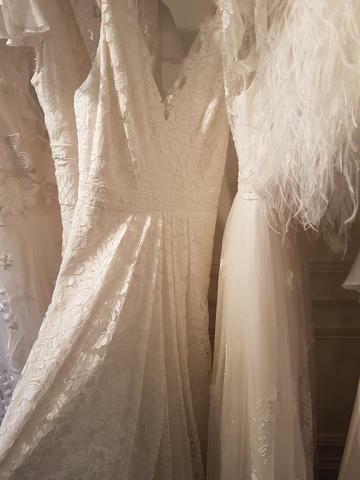 This really is the world of Temperley brides with perhaps fifty or more dresses on display. 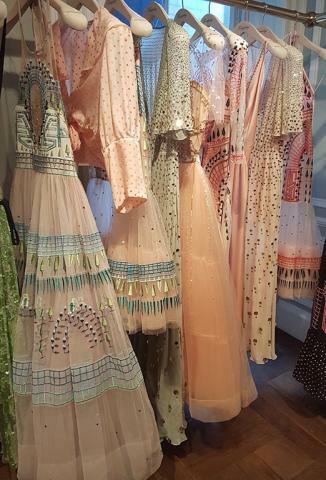 There was noted variety here with a lot of imagination in different designs and combinations of lace and applique detail but all styles have the classic recognisable long line look of Temperley London clothes. 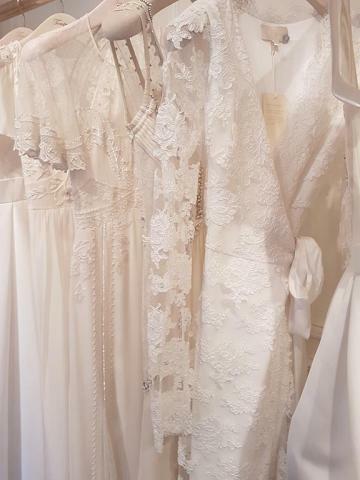 For Temperley fans and anyone interested in browsing the wedding dresses in her style there is plenty to ponder and consider. You could also choose to wear one as a white evening dress possibly as Alice's styles is a little different from the classic broad skirted wedding dress style. 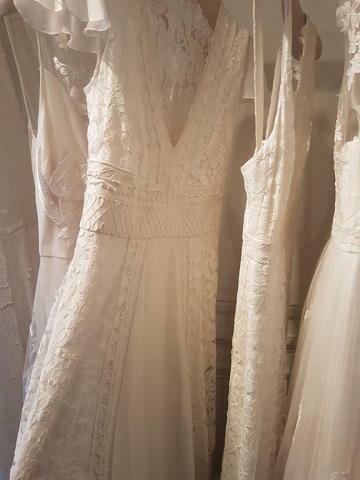 Find your heart's desire and then look for your perfect dress.